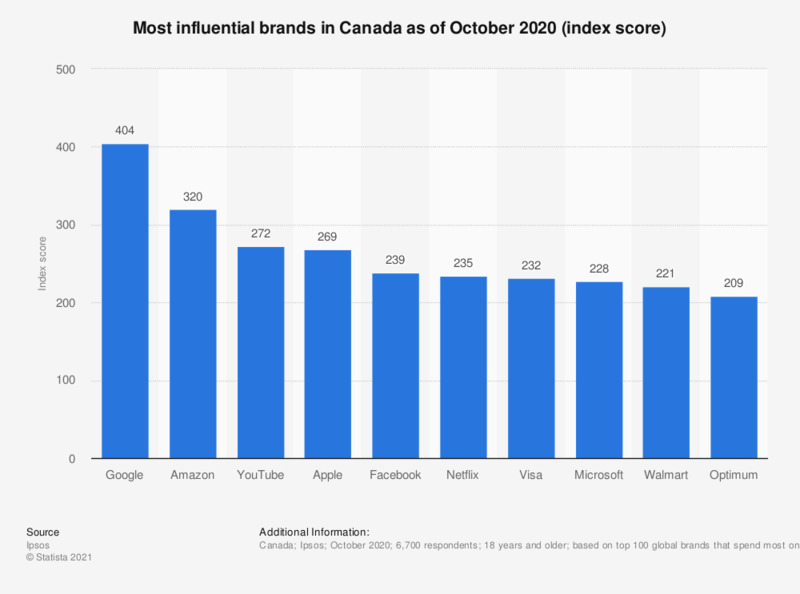 The statistic provides information on the most influential brands in Canada in 2018, based on an index score. Based on the answers of Canadian consumers, Ipsos calculated that Google scored more than four times higher than an average brand result (100 points) reaching a score of 412. Facebook was the fourth most influential brand in the country, with a score of 282. The methodology is explained as follows: the study examines five key dimensions that drive the most influential brands in Canada: trustworthiness, presence, being leading edge, corporate citizenship and engagement. The study ranks brands according to their influence. Everything On "Canada Post Corporation" in One Document: Edited and Divided into Handy Chapters. Including Detailed References. Which, if any, of the following retailers and brands would you say you have an emotional connection to? Have you ever stopped using a brand due to a scandal/negative press? What happened when you stopped using the brand due to a scandal/negative press? Which of these reasons have ever made you boycott a brand?